The High Line, opened in the spring of 2009, is one of NYC’s newest “must sees.” With its fascinating history and bright future, it is attracting Big Apple visitors, as well as many native New Yorkers. Dating back to 1847, a street-level railroad was built in the “Meatpacking District” along the west side of Manhattan, to aid with deliveries in the borough’s largest industrial area. However, the traffic was so intense in this crowded, bustling neighborhood, that 10th Avenue became known as “Death Avenue,” and “West Side Cowboys” were hired to ride horses and wave red flags in front of the trains. Finally, in 1929, an agreement was reached between New York City, New York State and the New York Central Railroad to construct an elevated freight line, 30 feet above ground, to put an end to the treacherous conditions. The original High Line opened in 1934 and ran from St. John’s Terminal at Spring Street up to 34th Street, allowing trains direct access to factories and warehouses where they delivered raw materials and picked up manufactured goods ready for shipment. Fast forward 50 years during which time the railroad industry took a back seat the the interstate trucking business. Trains stopped running on the High Line, and portions of it were demolished, leaving what was left of the structure to decay. 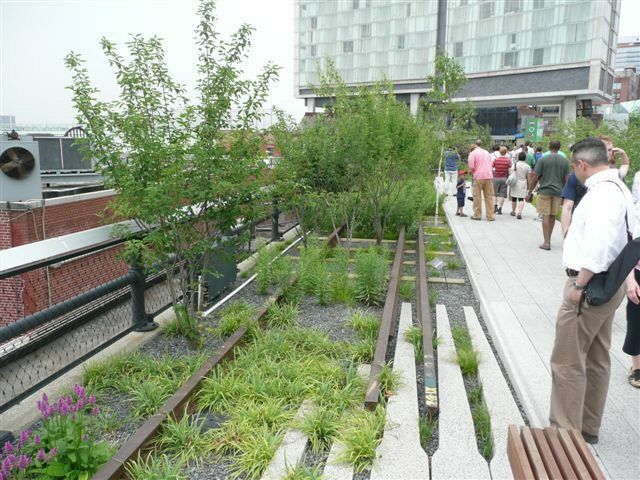 In 1999 a group of West Chelsea residents formed “Friends of the High Line” to restore it, and turn it into public parkland. Finally, in 2006, Section 1 of the reconstruction project (from Gansevoort Street to 20th Street) began, and, in June, 2009, it opened to the public. So what is there to do on an old, abandoned railroad line? What’s the big fuss you ask? We say it’s a totally unusual and creative space, offering views of the Hudson and parts of the skyline that can’t be seen elsewhere. It celebrates the industrial history of New York, while bringing it right up-to-date overlooking the trendy restaurants and boutiques that line the streets below. This is re-cycling at its best. The aesthetics of the High Line are also a monument to its past. During the many years of neglect, weeds and plants grew up among the tracks that had been abandoned. The landscape architects for this project designed the plantings to incorporate many species that grew here, while adding other wildflowers and plants evocative of a quiet, peaceful place. So if you are coming to visit New York or if you live here, take some time to explore this cool, elevated park. Currently open from Gansevoort Street to 20th Street, plans to open the extension to 30th Street in the Spring of 2011 are in place, and further expansion to 34th Street, which will complete the 1.5 mile walkway, are being finalized. For now, you can gain access at the southern and northern ends, plus at 14th, 16th and 18th Streets by stairs. Elevator access is also available at 14th and 16th Streets. Get there by taking the L/A/C/E or the 1/2/3 subway lines, or the M11,M14,M23 or M34 buses. Come to stroll, take in the views and relax on unusually designed benches and lounge chairs. Pets are not permitted, nor are loud music, bikes, skateboards, skates or scooters, but you can bring a book, refreshments and your Ipod, and chill out. Visit The Highline (212/500-6035, 212/206-9922) for a list of Events, Public Programs and Family Programs.